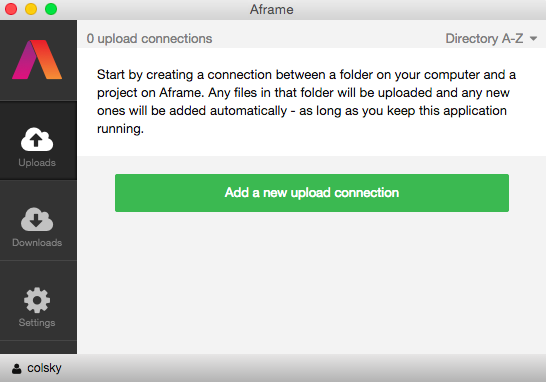 The Aframe Desktop App has been designed to make getting media into and out of your projects even easier, automating the in and out of your workflow. Once installed on your machine you can create connections between projects and localised folders of your choice, both for upload and download. Our desktop app will sit in the background watching your folders and projects for any new material to upload or download into your designated destination. The app also comes with Java built into it, so you don&apos;t need to have Java installed on your operating system. To access the Desktop App, you first need to download and install it. 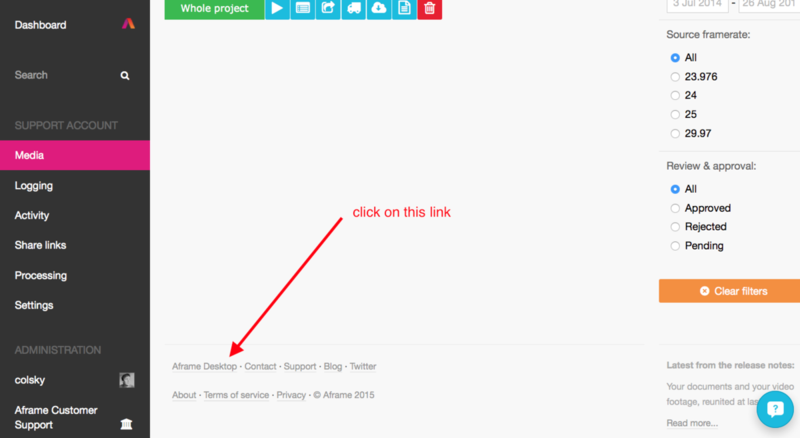 You can do this by clicking on the &apos;Aframe Desktop&apos; link, located in the footers at the bottom of every Aframe page (Once signed in) - as shown below. You will be taken to a page (shown below) where Aframe will recognise what operating system you are using, start downloading and explain how to install. Once you have installed the app, you will notice our logo on either your desktop program icons or your taskbar. Double/right click it and you will be presented the below login screen. You will now be presented with the below screen and the first thing we would recommend is heading to the settings page. As you can see in the screen shot below, you will now have the ability to select what transfer protocol you would like to set for your uploads and downloads, along with a transfer aggression setting. Speed protocol \- The best speed mode will depend on different factors such as your network configuration, security/firewall rules and proximity to our servers. It is worth testing each one to find the best mode possible. If you select Auto, Aframe will attempt to use UDPS by default, if the ports are closed, it will drop back to FTPS and then HTTPS if those are blocked. In some instances ports may be open but restricted in some way, which is why we recommend testing each one. Note: switching transfer protocols whilst transfers are in progress or paused, will not take effect due to the active connection. 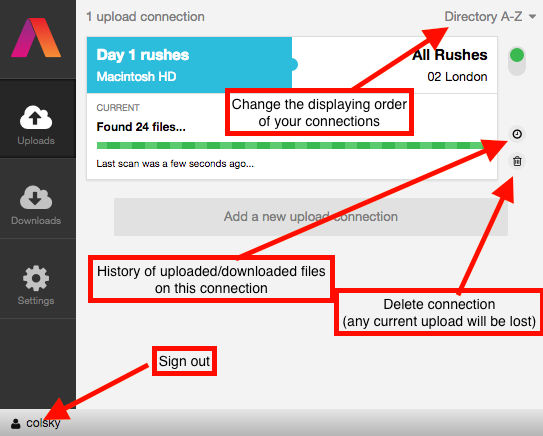 Either wait for the batch to complete or disable and re-enable the connection. 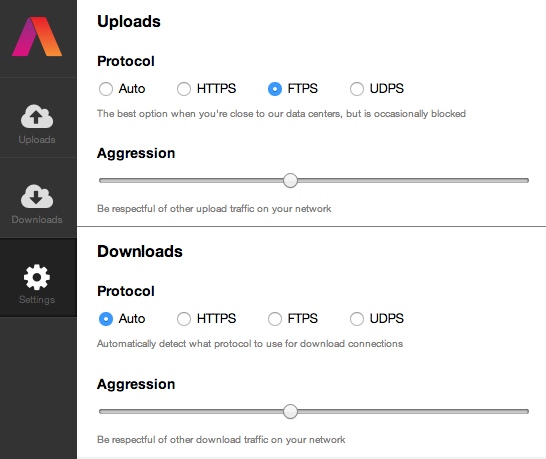 Transfer aggression \- This allows you to manage the proportion of bandwidth your network allocates to transfers carried out by the Aframe Desktop. Moving the slider from left to right will increase the aggression of the transfer. So, if the slider is pushed all the way to the right, the transfers will assume priority, consuming as much of the network bandwidth as it possibly can (effectively pushing other traffic out the way in some cases). When the slider is close to the middle, it will allow TCP traffic ahead of it but will still consume as much of the remaining bandwidth as it can get. When it&apos;s furthest to the left, the transfer will take a backseat to other traffic on the network, which could bloat transfer times. Note: Adjusting the setting whilst a transfer is in progress will not take effect until the next transfer. We recommend testing each setting to fine tune what works with your network and environment. Now browse and select the folder that you would like Aframe to watch. 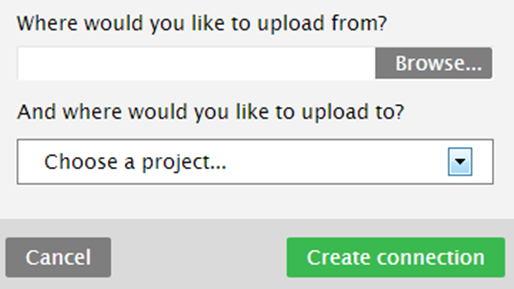 Then choose the project you would like Aframe to deliver the footage to and select &apos;Create connection&apos;. 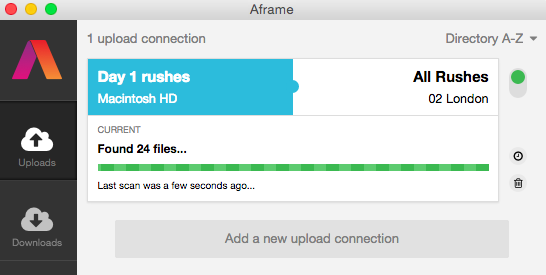 That’s it, Aframe will now watch that folder and deliver any video content to your selected project. When the desktop app is scanning (watching), the progress bar will show as blue. At this point it has not detected anything new or it has completed the upload. When new material is found you will see the progress bar change to green, as shown below. At this stage the application will check what content it is (cards/individual assets) and will then organise the best way of getting the footage into the project, meaning you are not waiting around for everything to complete. Once the uploading begins, the desktop app will display the progress of the current file, along with the progress of the total payload, as shown below. 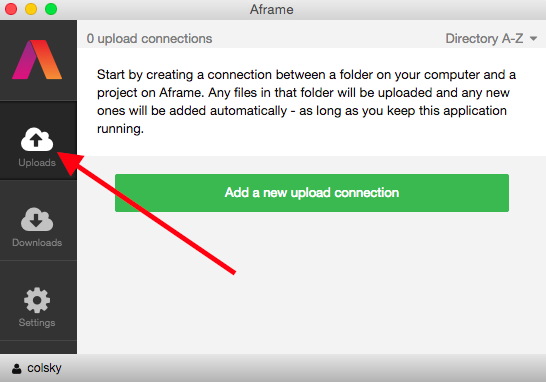 You can quickly access the folder you are uploading from and the Aframe destination project by clicking on either location, as highlighted below. The blue line represents your localised folder and the white represents that project in Aframe&apos;s cloud. Now click on ‘Add a new connection&apos; and choose the project from which you would like to download. You will then be asked which collection from which you would like to download from, then choose a destination folder from your local directory. Now select the green &apos;Create connection&apos; and that&apos;s it done. Once you have a mapped a collection, the download icon will appear in Aframe&apos;s web portal, next to the collection title, within the collections drop down window (as shown below). Whilst a connection to this collection is set up, the collection cannot be deleted or renamed. All connections would need to be trashed/deleted to remove this restriction. Important: If your internet connection drops out, your machine powers off or you disable the connection whilst a transfer is in progress, your transfer will resume as soon as your connection is active. When you log into the Desktop App it will check for new updates. Once its updated itself, it will ask you to restart it. To restart your app you need to quit the app and reload. Windows users right click on the Aframe icon from your windows taskbar and choose ‘Quit Aframe’. 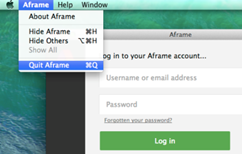 Mac users choose Aframe from the menu bar in the top left of the screen.